How Much Does it Cost to Travel in Spain? I´m sure it costs less than you imagine and a little more than you want to spend! So let´s talk about money and how to make the most of your travels without going bankrupt. Welcome to the Spanish edition of “How Much does it cost to Travel ”, where we breakdown our costs and share some of our travel secrets. Last editions we broke down our expenses and proved that Portugal is one of the cheapest destination in Europe and also that Philippines is an affordable paradise. Now the task is a little bit more complicated. Spain is not as cheap as Portugal and has a disadvantage of having lots of good parties. What is really tempting to us and also a money drainer! 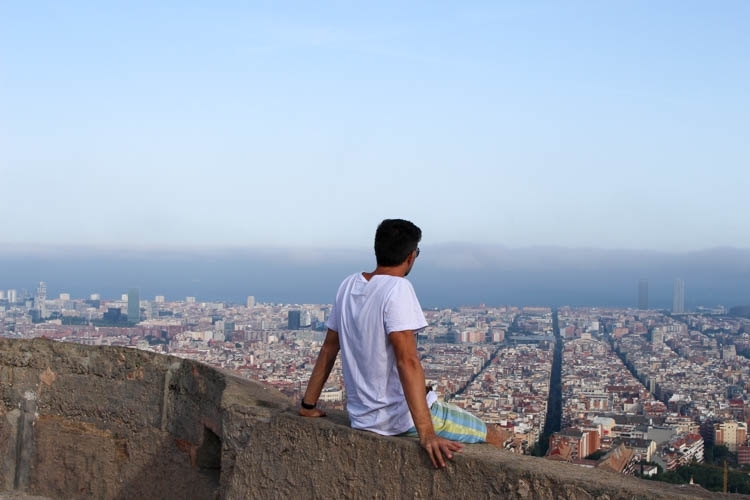 Before we start talking about how much does it cost to travel in Spain, let me explain that our travel plan is to stick to a budget of $50 usd per day per person. If you are not familiar with our travel budget plan, have a look at this awesome book: How to Travel the Word for $50 per day by Nomadic Matt. You will understand how is easy and possible to travel on a shoestring. Spain was the second country we explored in our Love and Road Project. We have already travelled there before, as tourists, not as nomads and travel bloggers. And that’s a completely different way to approach the cities and collect information. Travel to Spain on a budget was a good experiment for us, there we had the opportunity to try many different ways to save money, travel wisely and have fun. We are pretty happy with the result and proud to share our details of how much does it cost to travel in Spain. Dates: May 25-29th, 2014 [We went to Portugal and Morocco] and June 3rd – July 3rd, 2014. Cities: Madrid / Toledo / Barcelona / Valência / Elche / Murcia / Almería / Mojacar-Cabo de Gata / Málaga / La Linea de La Concepcion. During our Spanish tour we practiced some tricks and hacks to stay for free and minimize our expenses. Apart from having a bed for free in friend`s house there are other ways to find cheap accommodation in Spain. If you like hotels and hostels, you will find plenty of them around Spain. You can choose by the rates, prices or locations. On the coastal cities, most of the hotels have studios with kitchenette, what can be a great deal. 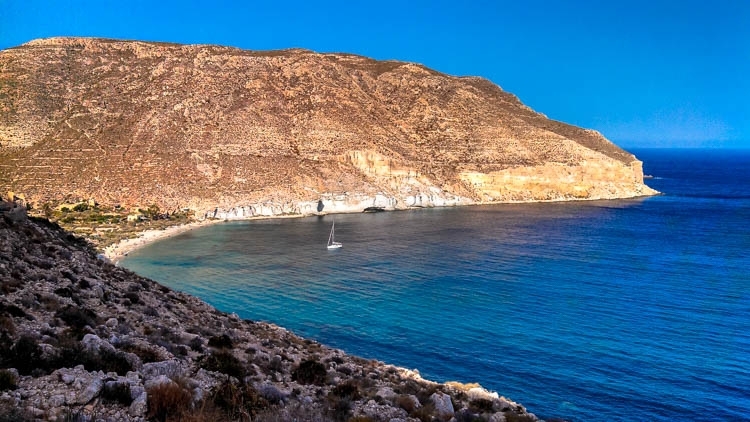 When we visited Cabo de Gata, a secret and beautiful destination on the Spanish coast, we got a studio room for a really cheap price on Booking.com. For cheap and comfortable accommodation in Spain we found Airbnb to be the another good solution. We got amazing places, awesome hosts and spend such small amount of money. Be part of the Airbnb community, we are giving you $20 usd off on your first booking, just need to sign up here! Start your trip to Spain saving some bucks! Now the best advice for free accommodation in Spain [and everywhere around the world]: Become a House Sitter. There are many house owners seeking for trustworthy and reliable people to look after their house and pets. This is such a cool way of traveling that we even wrote a post about house & pet sitting. It’s one of our top 10 articles. If money is not a problem check these hotels out. They are the crème de la crème! In Barcelona: Mercer Hotel, Casa Camper & Alma Barcelona. In Madrid: Hotel Orfila, Hesperia Madrid & The Westin Palace Madrid. In Ibiza: Ca Na Xica, Ushuaia Ibiza Beach & Hacienda Na Xamena. Here is everything we bought in a supermarket or street markets. At the places we stayed through Airbnb or house sitting we had a kitchen, so our breakfast and sometimes lunch/dinner were prepared at home. This was a great way to keep the budget low and eat well. On the market costs are also included the toiletries and cleaning product we bought on the way. Spain is an open air museum with tons of attraction to visit and see. Art galleries, parks, heritage sites, a bunch of beautiful and interesting stuff. Most of them charge entrance fee, what can ruin your budget in a long-term travel. However, the solution is very simple, instead of cashing out money, do a good research about the attractions and if they have a day with free entrance. 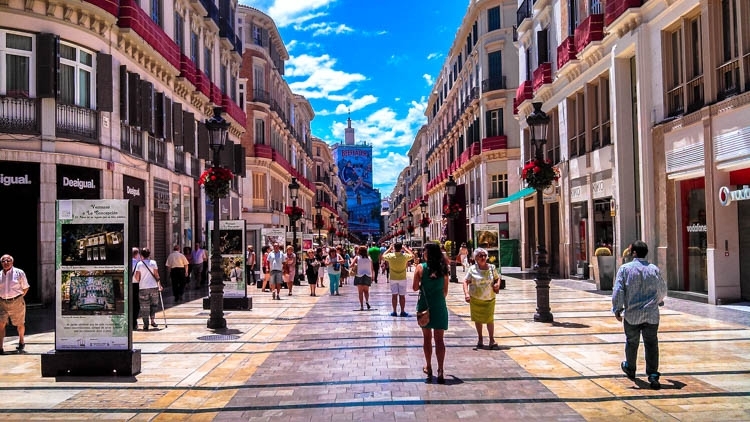 In Málaga we had an amazing time exploring the city and its attractions without spending a penny. During the weekend most of the places are for free, and we listed all them on a great guide about Malága. Madrid is another budget paradise, two of the biggest museums in the city are open to the public for free in some days of the week. A smart traveller knows how to find ways to save money! Barcelona is an expensive city, although our second visit there was really a budget success. 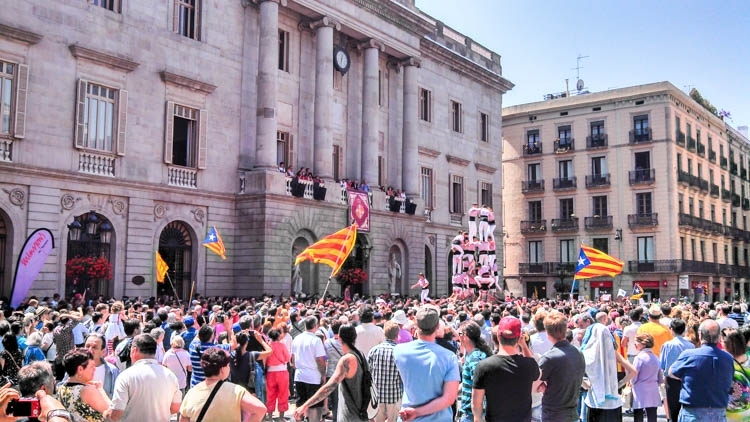 That’s because we discover the real Catalan style of fun, we learnt how to enjoy Barcelona like a local, and when you do local things your money stretches a lot! Other important tip for those who want to travel in Spain on a budget is to book the tickets for the attractions in advance. In Barcelona for example, you can save hours of your day if you buy online the ticket for Sagrada Família. The free walking tours are a great way to get to know the city and save money too. We did walking tours in almost all the places we visited in Spain and thumbs up! You can search the tours on internet, Tripadvisor is the best place to found them and check their reviews. In Valência the walking tour was outstanding! In one day our local guide explained us about culture, history, food and drinks. 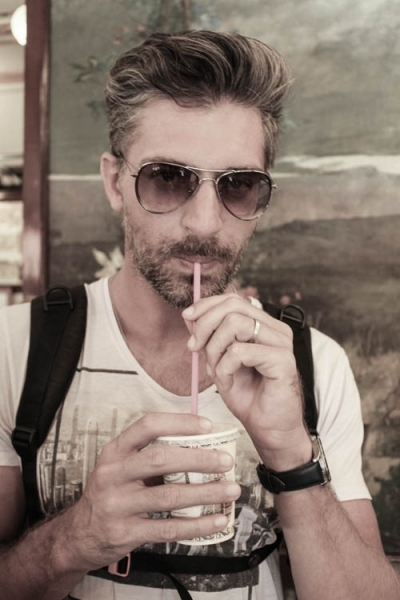 Because of him we enjoyed the city a lot and I got hooked up on Agua de Valência, and Rob tried Horchata, two typical & delicious drinks. As I already said, Spain is a paradise for party and fun. 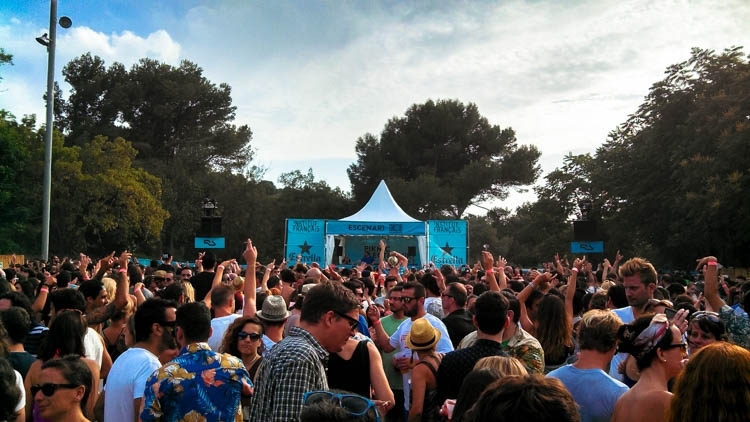 How can we ignore the summer mood in Barcelona, the beach parties at Costa del Sol, and so many festivals?? Tough to resist! We enjoyed all them, no regrets! 😉 And I think by the amount of fun we had we didn’t ruin [that much] our control of how much does it cost to travel in Spain. So, How Much does it cost to Travel In Spain? It cost to us € 2,144.18! This amount was for two people for 36 days trip, and on June/2014 it was $ 1,468.76 usd per person. Congratulations to us!!! We made it! Spain in summer time for less than 50 usd per day per person. We had tons of fun, we enjoyed the cities, the beaches and the amazing Spanish cuisine. You see, you don’t need to be rich to travel, either sacrifice your fun to save every penny. The key is to research a lot, check prices and find smart ways to save money. It was possible to find out how much does it cost to travel in Spain because we took note of all our expenses. The best advice I can give to you is to keep control of everything, what you buy and pay. And never, absolutely never, give up the fun and unforgettable moments just for saving some bucks. You are in a different country with amazing culture and attractions to enjoy, do it! Planning a trip to Spain?! Pin this post for later!! PS : Our cost does not include the inbound and outbound flight to Spain. The price of the transport will always depend on where you are coming from and where will be your next destination. Now let’s talk about you, do you keep track of your travel expenses? Have you already travelled to Spain? 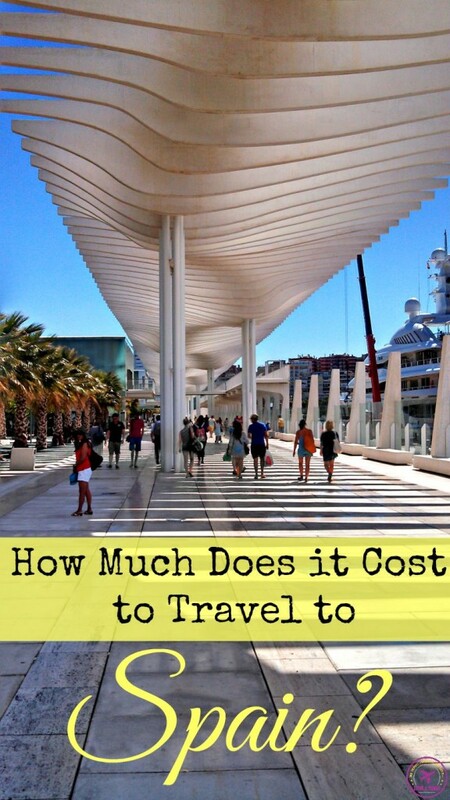 How much does it cost to travel in Spain on your style? Looks like a beautiful place to visit! I’m surprised that the food was such a big part of your budget, but good thing you got a sweet housesitting gig! Sure it’s a great place! Yes, and Bubulina(the cat) was lovely! Thanks for showing the good, the bad, the cheap, and the pricey. I love how affordable it is to see the best attractions in Spain and how many of them are free – definitely makes it appealing to visit. and don’t forget the food!!! SOOO delicious! Nice post! Spain is definitely not expensive, and there are great value for money options if you look hard enough. I also thought that the local food was excellent for the price, I had a full meal of tapas and wine for as low as 10-12 euros in some towns and that seemed amazing to me! That’s the key point. Value for your money. You can have great fun without spending tons of money. Congrats. $40/perspn/per day is great! 12 days of house sitting was a good help. We probably spend the same amount but the breakdown would be a little different. Spain is one of the cheapest places to tour in Europe! Yes, Spain offers a great value for your money! 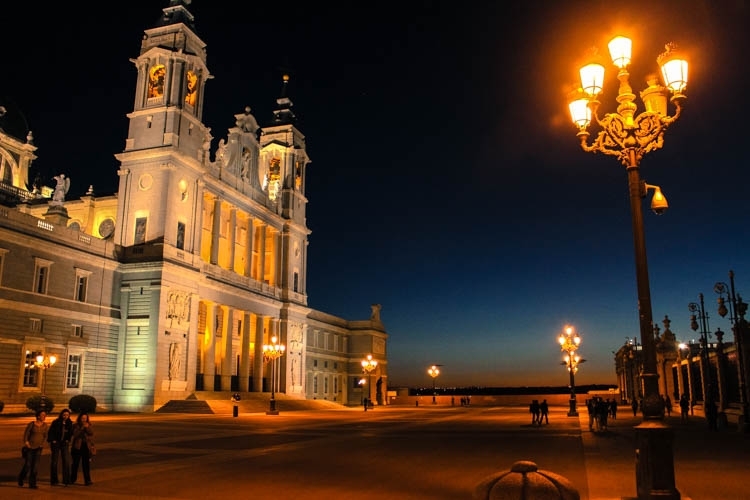 Spain is a great destination for your budget! We stayed in Granada last year and it was ridiculously cheap. We received free tapas with every drink! In the evenings at sunset people gathered at the viewing points and drank wine ( 4-8 euro per bottle) or beer(1-2 euro) in the open. However, we did splash out on an apartment with stunning views overlooking the Alhambra though! 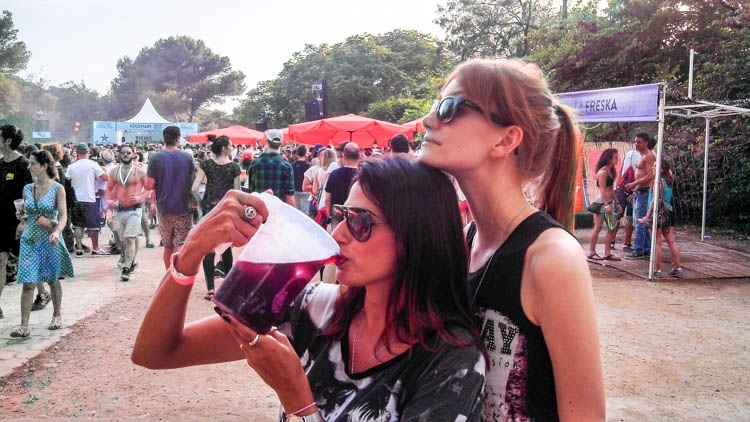 Great tips on how to minimize your costs in Spain while still having a great time! Tks Brianna! Spain is one of our favourite places in europe! It has surprised me how little you can spend in some places in Europe – and still have a fantastic time. Great post and thanks for being to open about the costs. We also found Spain surprisingly affordable, even for a family. We also hit the grocery store and avoid the tourist restaurants. We had some of the best meals eating in the neighborhoods or locals areas and saved a ton of money. So Hacendado & Mercadona are familiar names to you? One of the best tapas we have was in a small bar in LaLinea de la Concepcion. Cheap & Delicious! Granada is just one of the many reasons that we have to return to Spain! Hey Natalie, another fab post guys! I always admire how you manage and remember to write down EVERY cost (even the WC!) That is some serious commitment right there. Amazing and so useful… I’m so dappy and quite often feed my face so quickly that I forget to make a note of the cost ;)… going to be taking a leaf out of your book from now on. Great photos also… will be sharing this one! Glad you liked and tks for sharing! Spain is such good value in my opinion! I couldn’t believe how inexpensive it felt on our first trip here earlier this year. The price of Airbnbs, groceries and eating out was so reasonable. And the cava, 2€ for a glass in a bar!? Amazing. You are so right Bethaney, cava for 2€ is definitely a bargain!! What great tips. Some, like house sitting, work better for a couple or single, rather that a family with kids! We find the number one way to keep expenses under control is to eat local – like you! Cook or make sandwiches and eat off the beaten path. You get even better food for an even better price when you do that! Thanks for stopping by Natalie!! I´m glad you liked the post! Cooking at home or eating at local diners are definitely the best way to save some money, specially travelling as family and with kids. GREAT breakdown! We’ve looked for budgets for Spain and this one is definitely the only one that aligns with our style of travel. We’ll be keeping this around for when we get to Spain (It’s our goal for the moment) and BlaBlaCar is a great suggestion and something we hadn’t known about!! Thanks for sharing! So happy that you found the post useful! If you need any more info about Spain send us a message, we have been there a couple of times and LOVE it! While in Europe give a chance to BlaBlaCar, safe & cheap!! Lovely pics of spain love your blog. It takes a lot of effort to calculate your expenses and I’m always impressed when you do. It is super helpful for those wanting to estimate travel expenses. Well done again! In the beginning was quite hard to keep track of everything, but now it´s easy and the best way to keep our expenses under control. Before we started travelling I was always searching for blog posts with costs of travelling, and sometimes was hard to find useful information. That´s why we decided to do our “How Much does It Cost” posts, it might help someone out there planning to travel! I love when big cities have there museums and things for free, its like they are saying COME LEARN… but for someone whose been around Bolivia, Nicaragua and Colombia for 2 years…Europe seems crazy expensive so price saving tips are always welcome! Impressive list yet again, much more thorough than my own records. Party is definitely our guilty pleasure! Thanks for the detailed breakdown and tips! We are headed to Spain next month and this is very helpful (and encouraging) as we have the same budget. That´s good to know Christine! I’m glad we could help you planning the trip! Enjoy Spain is such an amazing country, and the food simply delicious! Have fun! Very useful post for us as we’ll be touring Spain as part of the Euro leg on our 18 month career break. Our budget will be blown out of the water with Ibiza but we are comfortable with that. It’s good to see a realistic breakdown though and thanks for the heads up on Blablacar! Give a try to BlaBlaCar, it’s cheap and safe! Great post, i loved your descriptions and rationale for each spend….sometimes it’s not just about the money, but how you choose your spends that makes it so interesting! How many nights out did that part of the budget cover? From the top of head 5 nights… or 6, not sure. Well done guys! We keep crossing paths around the world. One of these days we need to meet up! So I am a big fan of budget and expense posts, so I love seeing what others are doing and spending too. Of course we are a family of 4 and you are a couple, so a few differences. I can’t wait to share this with our readers as well. Keep it going! Now we are back in Thailand, maybe we can catch up around here. I keeping following your budget posts, and I have to tell you that I am very impressed with your figures. It´s not easy to travel full time as family with kids, and still manage to keep the budget under control! Well done!!! Thank you for the breakdown but Spain is a bit expensive compared to Uganda because in Uganda very few euros can be used for big things here we can help to organize tours to Uganda for individuals and groups of people who would wish to see the gorillas,tree climbing lions ,buffalo’s,and many more wild animals at a very cheap rate. Tks for the heads up! We plan to visit Africa on 2016, might get in touch with you. Just got back from Spain. We are not budget minded travelers because we have done well in life but I enjoy reading your blog. Our video blog on YouTube is aim at Travelers just like us. How ever some of your travel tips are great for us. Glad you enjoyed reading the post!! Spain is an amazing destination!! To have cheap accommodation you can added the hosteldeals card. Lovely blog guys! tks for the tip Ardjette!!!!! 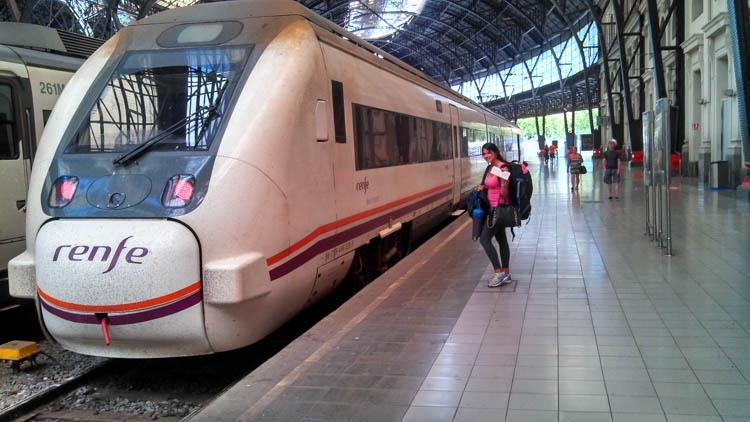 Great post and thank you for showing the different aspect of Spain. I know per fact that Spain is not expensive. Great photos BTW. 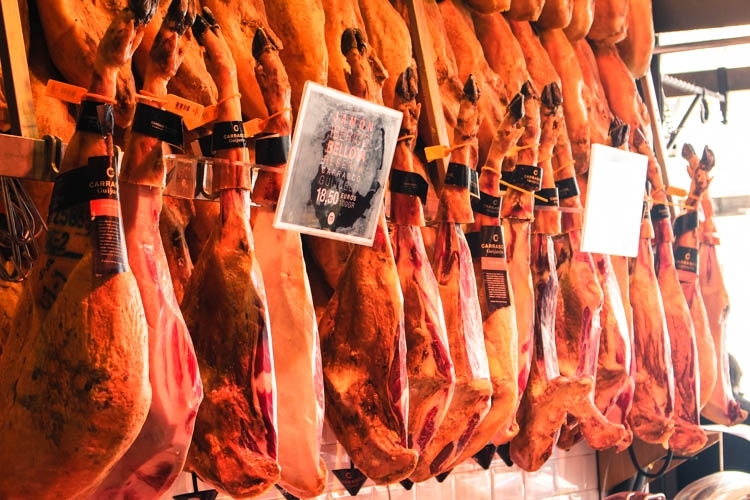 Spain is an amazing country, not only beach it´s one of the cheapest in western Europe, but also because of the food, the culture and the people! Thanks Guys for this detailed guide, i’m planning my visit to Spain in few days and this is a great help. Keep it up and Visit Morocco Some More. Thanks Imad, Spain is a lovely destination. And we hope to return to Morocco soon! Maybe it’s because in some places the Government Environmental fees are higher, and the costs of will always depend on the style of your travelling. Very Informative article! Spain remains my favorite destination in Europe. I just love Costa del Sol! Check out Benalmadeana. This is such a great article! I thoroughly enjoyed reading through this, you’re photos brought back a lot of good memories from when I visited Spain a few years back. I really do want to go back. The locals were really friendly. Don’t tell me, I’m missing Spain too. Specially the food and the people. Spain is a wonderful country. It has a lot to offer for its visitors. After Spain, endeavour to visit Africa as well for much more tours and safaris at best. Africa certainly has a lot to offer!